Task 2 - Write a report for the director of the travel agent on how information is communicated. Introduction The director of the travel agents has came and asked me to make up a report on different methods of communication. I am to produce a report that will explain how information is communicated and technologies that support communication methods. I will write about the many types of communication and how they are communicated. Before I start writing my report I will have to plan what I will be writing and what I'll be including. I will be including a title page, contents page, introduction, methodology, findings, conclusion, recommendation of the best methods, any appendices and a bibliography. In the order I have wrote them. I will be writing about many methods of communication. I intend to cover the following areas, * Written Information * Verbal Information * Multimedia Information * Graphical Information * Video Information * Audio Information * Web Based Information I will then comment on the advantages and disadvantages of these methods and finally give a conclusion and recommend the best methods. Prototyping - Font Type and Font Size Times New Roman - Size 10 Times New Roman - Size 12 Times New Roman - Size 14 Arial - Size 10 Arial - Size 12 Arial - Size 14 Comic Sans MS - Size 10 Comic Sans MS - Size 12 Comic Sans MS - Size 14 Corbel - Size 10 Corbel - Size 12 Corbel - Size 14 Script MT Bold - Size 10 Script MT Bold - Size 12 Script MT Bold - Size 14 Report To Mr J Johnson Travel Agent Director From Katrina Hamill Personal Assistant Ref KH/JJ Date 30 September 2008 Give a report on the different methods of communicating information and the technologies. 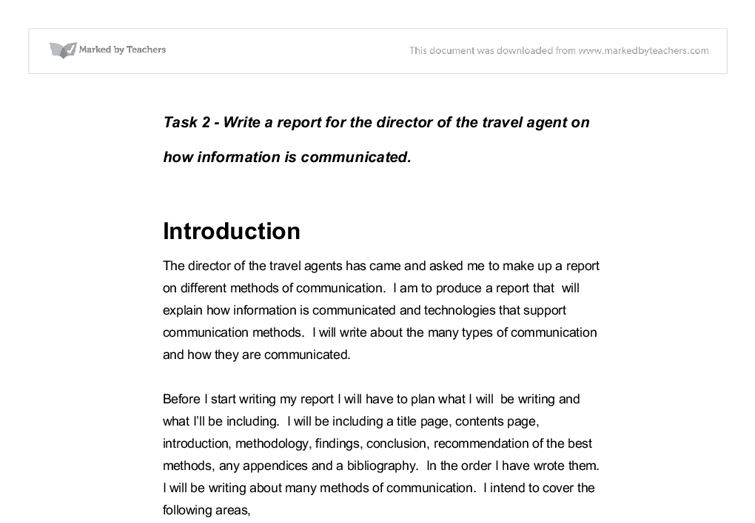 1.0 Introduction I have been asked to write a report to you, the Travel Agent Director, on the different methods of communicating information and the technologies that support them. ...read more. * Quick and convenient. Disadvantages * Bad signal can delay the message. * The phone must have money on it if it is 'Pay As You Go.' * Readers must understand the text lingo to understand the message. Radio Radio is communicated by electromagnetic waves and radio signals. The first type of radio is the public radio. There are many different channels on the radio ranging from sport to music. You can only listen to a radio broadcast if you have a radio. The second type of radio would be the two-way radio. Although this type of radio relies on both parties to be on the same frequency. Advantages * A good way to communicate to a number of people. * Provides entertainment and news to listeners. * Convenient. Disadvantages * Signal has to be good. * Can't play it back and re-listen. * Two-way radio is very limited. Television Most sources of television are broadcasted to the public. It is a very common way of communicating. Television communicates both video and audio communication and is a big part of media information. It is also a good way to advertise. There are many different channels that people can subscribe to. A television is required and some form of satellite. There is also CCTV, which is security cameras television for use in shops and banks etc. Advantages * Television has a large number of viewers interested. * Great way to advertise a product. * Conveys a great deal of information in a short space of time. Disadvantages * It can be expensive to buy channels/set up CCTV. * People can become lazy and unsocial if they are always watching TV. Telephone Telephone communication is a two-way system, in some cases 3 or more. The person using the telephone must have the number of the person they wish to contact, the person they wish to contact must also be phone accessible. ...read more. At first I would have thought that written and verbal are most common, but multimedia, video and web-based is becoming increasingly more frequently used. Again there were many methods, and I wouldn't say there was a most common used. Although the least common I would say is radio for communicating. I was quite interested to research the different methods, as I would be quite familiar with a lot of them such as paper-based, SMS and television. A lot of these methods are used repeatedly, every day for most of us. I was also interested to research the different technologies that support communication. 5.0 Recommendation Depending on how many people there is and the information that needs communicated, I would recommend that for large groups that multimedia, video or graphical information be displayed. Using the screen-based method, projectors and interactive whiteboards. If the information were confidential I would recommend paper-based as a record can be kept and it can be password protected. This would be a far better method than discussing the confidential information verbally in front of others. The method and technology used for communication will depend on the amount of information, the number of people it will be communicated to and the type of information. Evaluation I feel that my report went well overall when researching the necessary types, methods and technologies. I do however feel that when I wrote about each that I was very brief and should have included more information. I feel that my report was very well laid out and easy to read through with my sub-headings, which I think made it look very professional. I feel my report met its purpose to 'Write a report for the director of the travel agent on how information is communicated.' If I were to carry out a similar task like the report I would include a lot more detail into each part. I think I would also include more in my recommendations and in my conclusion. ?? ?? ?? ?? 1 Candidate Name: Katrina Hamill Candidate Number: 6049 Centre Name: Larne High School Centre Number: 71433 ...read more. a password system for security; UR35: be easy to understand for the user. UR36: be able to back-up data UR37: have a disaster recovery plan management strategy Information Requirements In addition to the end-user requirements, I have also been able to discern the information that the new system will hold and use. o All changes that aren't being made to customer's orders will now take place, as this information can be sent across and back within a few clicks. o The new hardware for example, printer or scanner, will allow the company, to print out invoices, new menus, flyers which can be given to customers along with their orders. switches are intelligent versions of hubs, bridges are intelligent versions of repeaters. Bridges are used to interconnect two separate LANs, perhaps on different floors of a building. They listen to the network traffic and learn which destination address is located on which LAN. manipulate or input in the client side code, ie., user input forms, changing the size of the text or on some sites like iGoogle, changing the way out of the site. b. Is there any difference performance wise between them? is extensively used it refers to the structured transmission of data between organizations by electronic means. It is used to transfer electronic documents from one computer system to another. 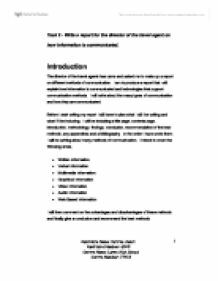 EDI is used through Email which is a method of exchanging digital messages. Moreover, a black market exists for resale the SIM cards and handsets and the value of between �10 and �60. Once mobile phone thieves could face up to five years in jail and unlimited fines under emergency legislation, a greater percentage of street crime of mobile phones increase rapidly. The employer knows the capability of the employee and aims to the standard which means that they know the level of effort of them. Professionalism- The employee does the work to the best of their ability in a professional standard, does the work to the best of work.